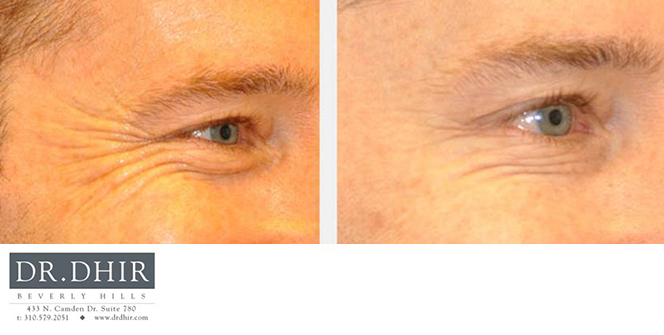 With age, however, parts of the face can lose volume as well as sag or droop due to the long-term effects of gravity. 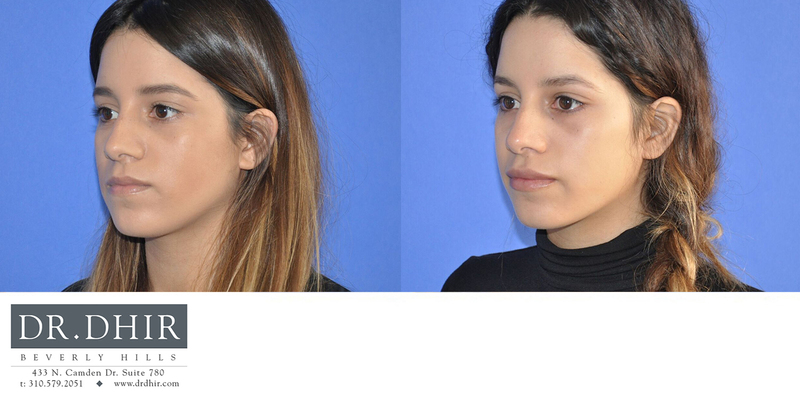 This effect of gravity and volume loss is responsible for fine wrinkles, hollowness under the eyes, deeper smile lines, deeper frown lines and loose skin of the neck. 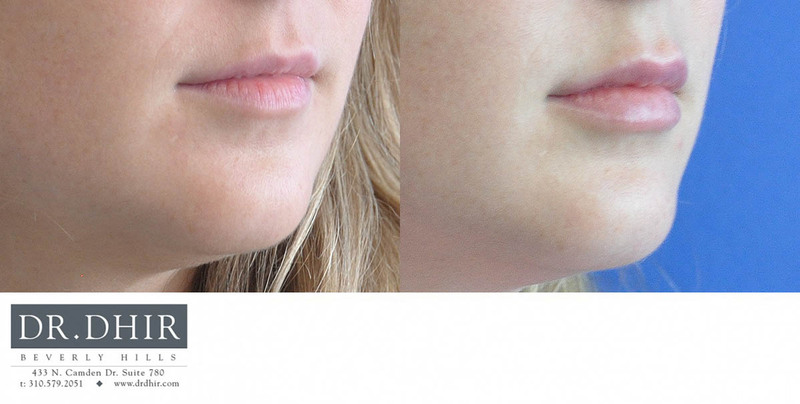 Also, the lip region can begin to lose volume resulting in a thinner lip without shape, pout, and enhancement of the “M”, or peaks, of the upper lip. 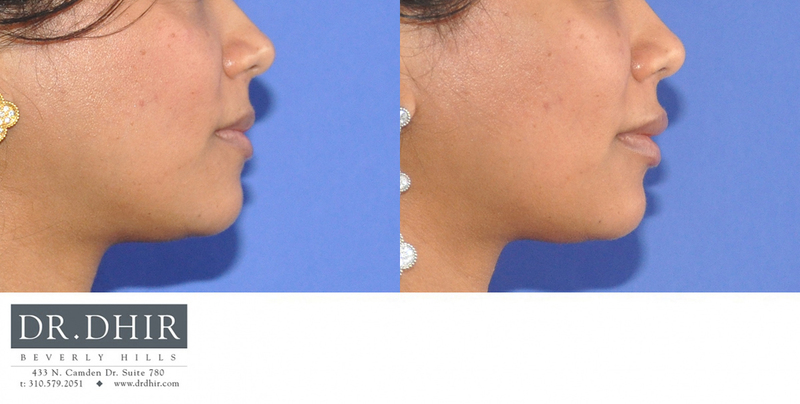 This is where Dr. Dhir can help. 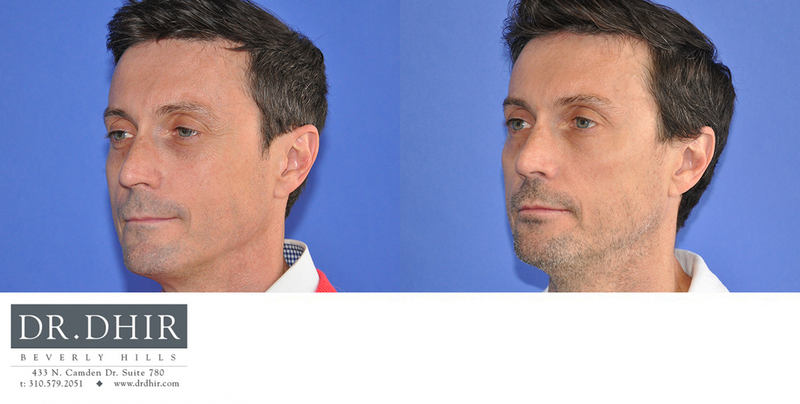 He is a double-board certified facial plastic & reconstructive surgeon with extensive expertise in botox, facial fillers, lip enhancement, non-surgical facial rejuvenation, no surgical medical devices. 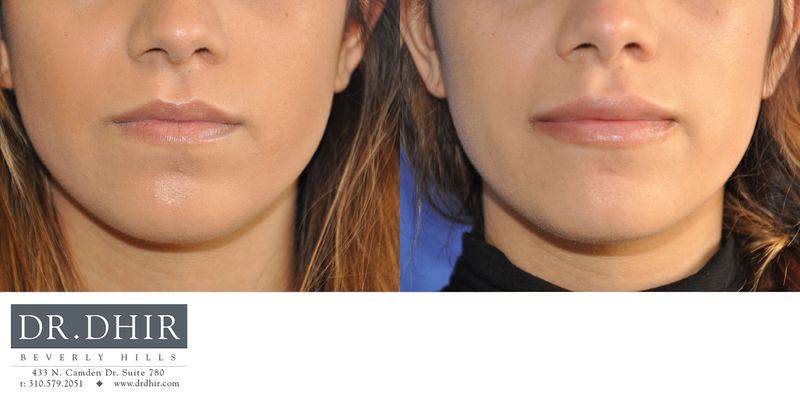 Dr. Dhir continues to devote his time to FDA clinical research trials in order to maintain an edge on the state-of-the-art products and surgical procedures available. 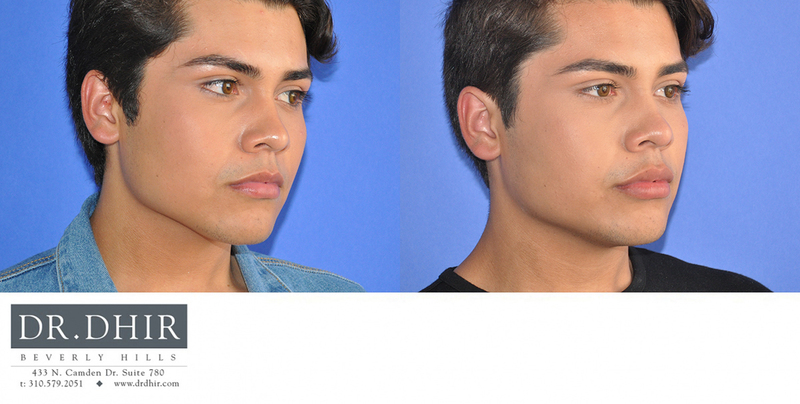 His philosophy is to empower his patients by building a strong relationship and offering education before each treatment. 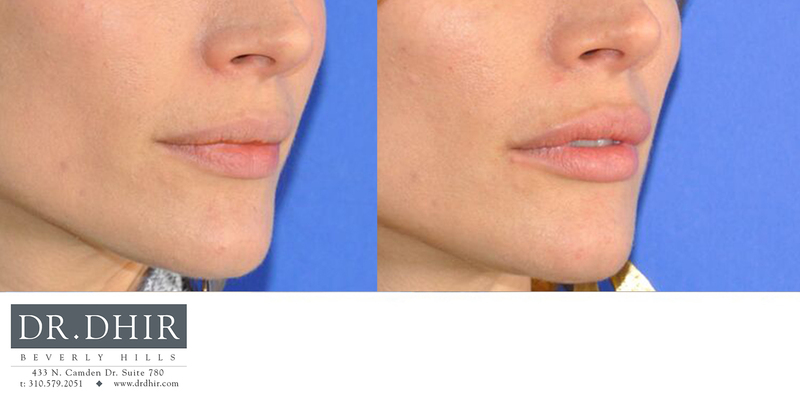 He strives to keep each patient looking natural; yet, with a bespoke beauty based on a customized treatment plan. 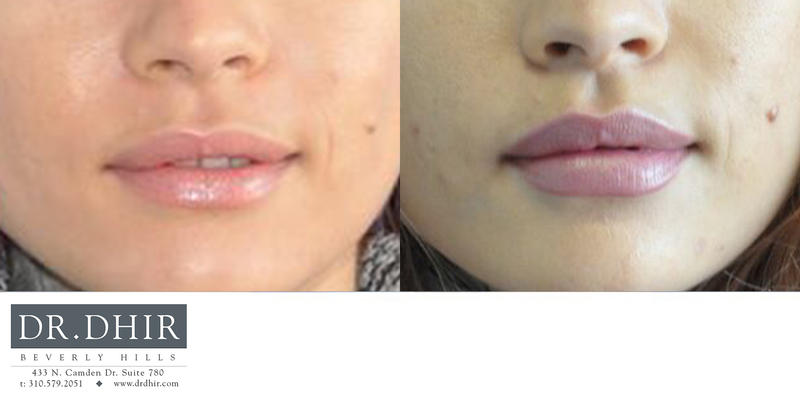 Botox and fillers are both non-surgical injectable facial rejuvenation procedures with low risk and high satisfaction rates. 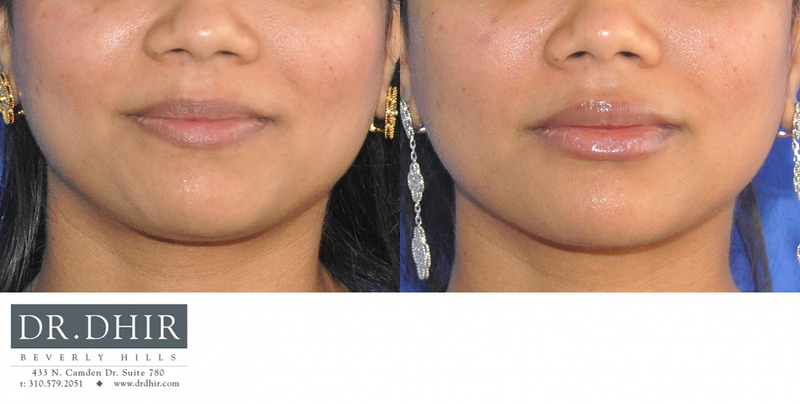 Botox works on fine wrinkles of the face most commonly around the eyes (crow’s feet), horizontal forehead lines, vertical lines between the brows and fine lines above the lips. 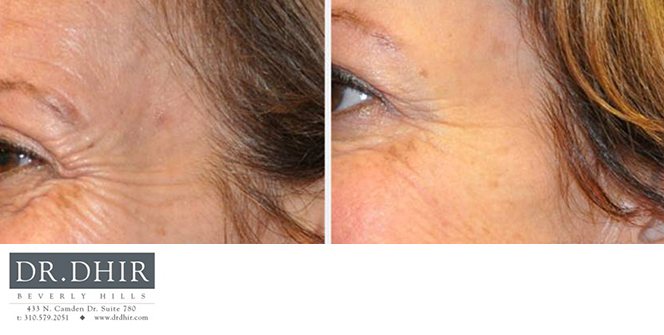 It temporarily flattens the wrinkles for about 3 months resulting in smoother skin and a refreshed appearance. 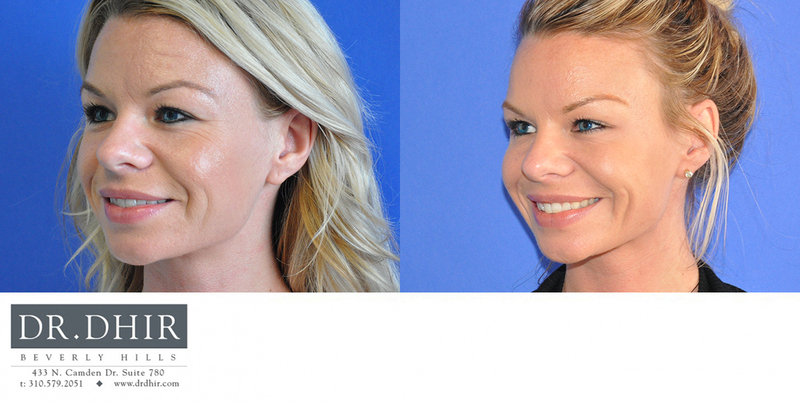 Botox is a common facial rejuvenation procedure performed by many different health care specialists. 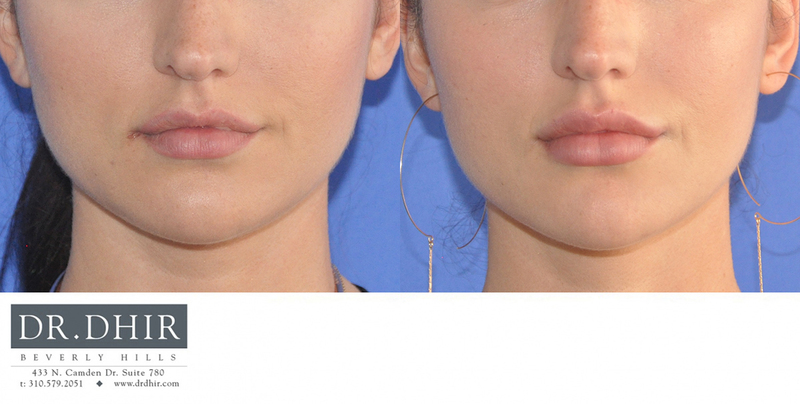 Surgeons trained in the art of facial plastic surgery understand the necessary anatomy to obtain safe, effective and reproducible results. 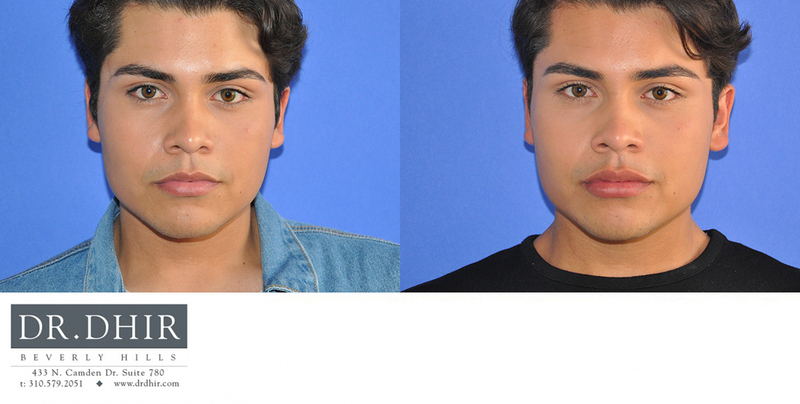 The goal is to maintain facial expression and maintain proper brow position. 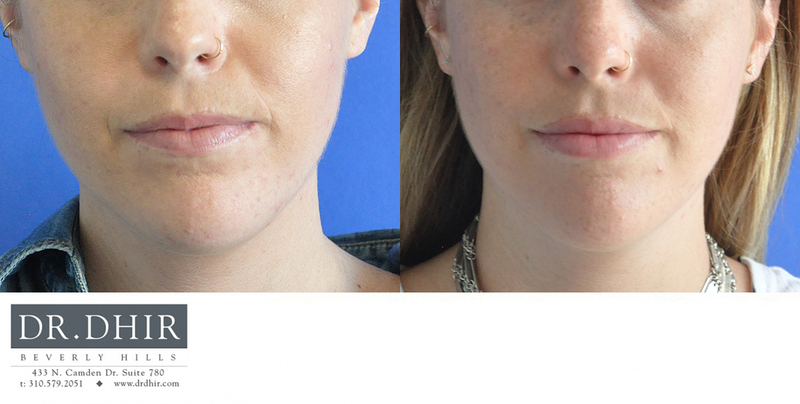 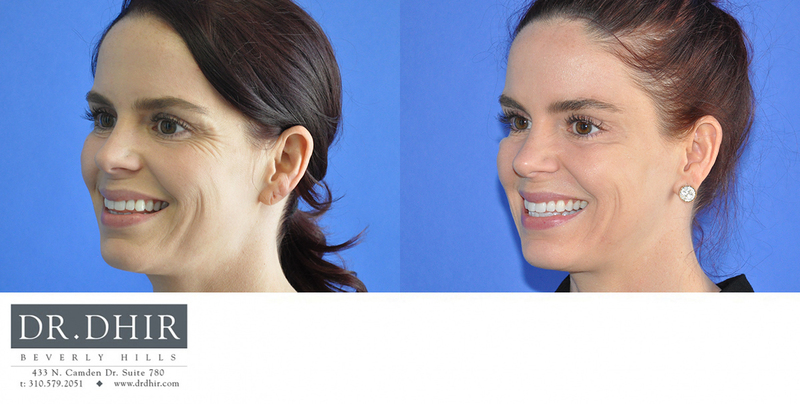 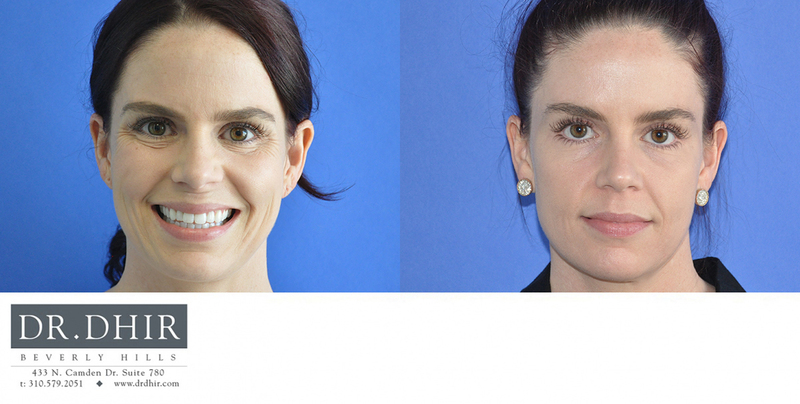 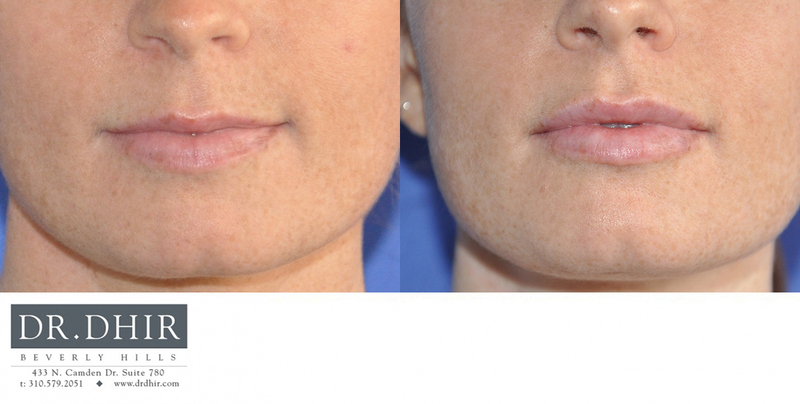 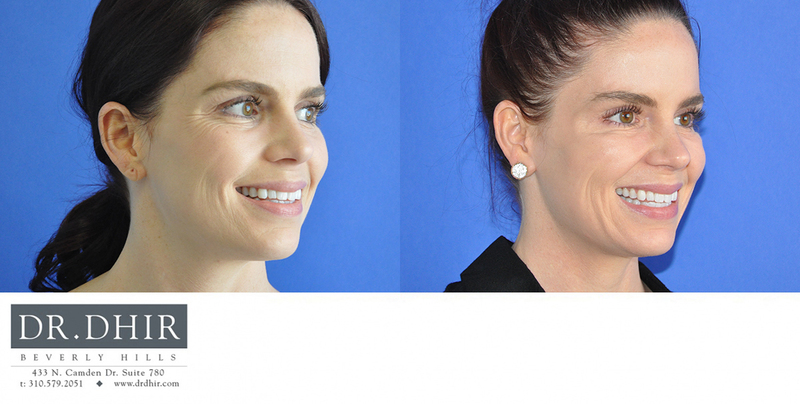 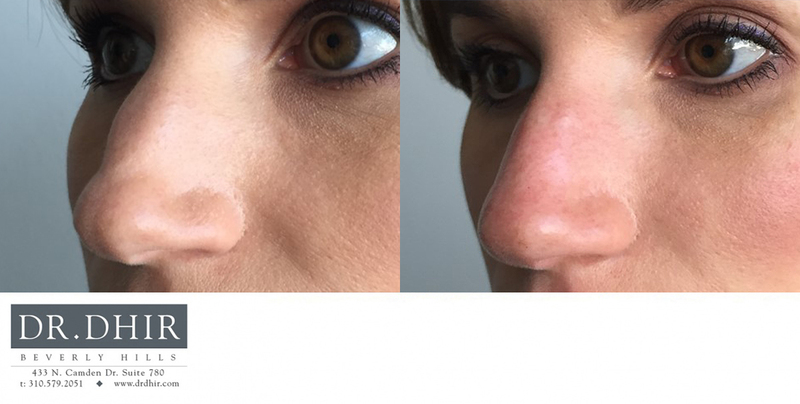 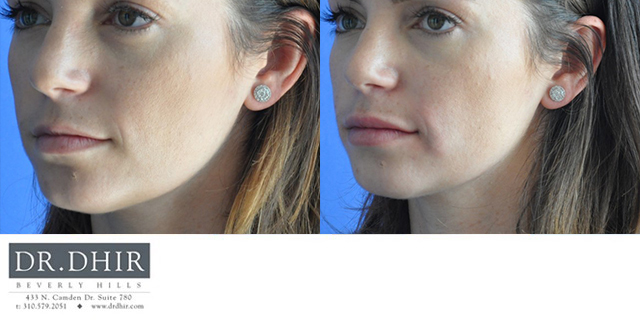 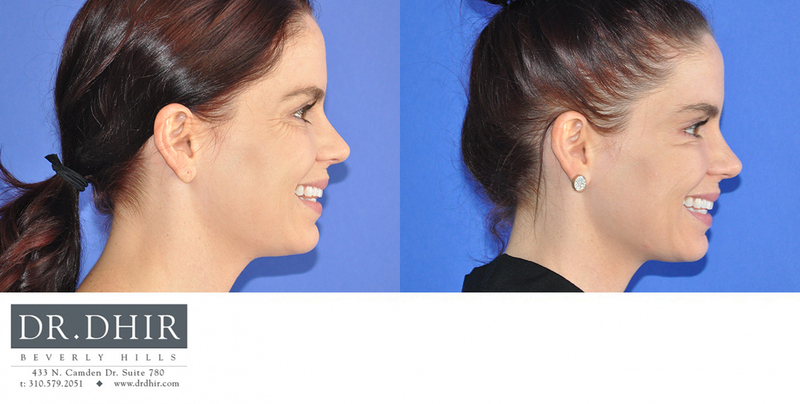 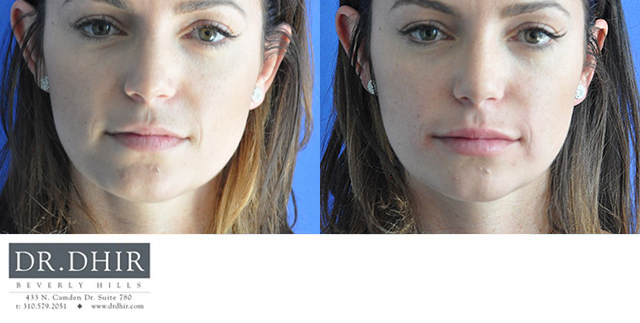 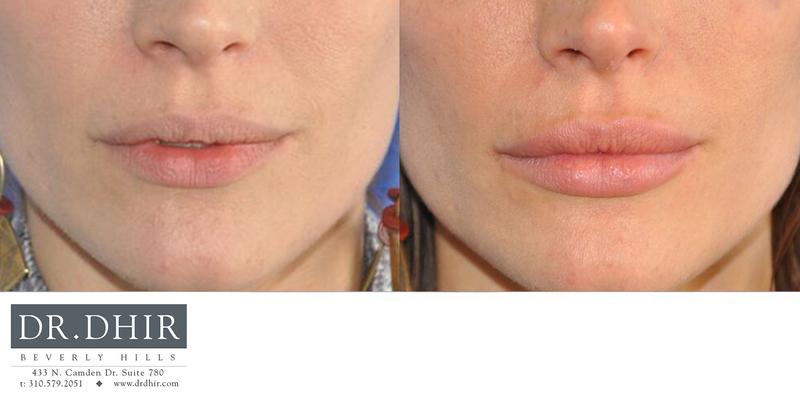 Fillers are safe options to provide volume to key regions of the face. 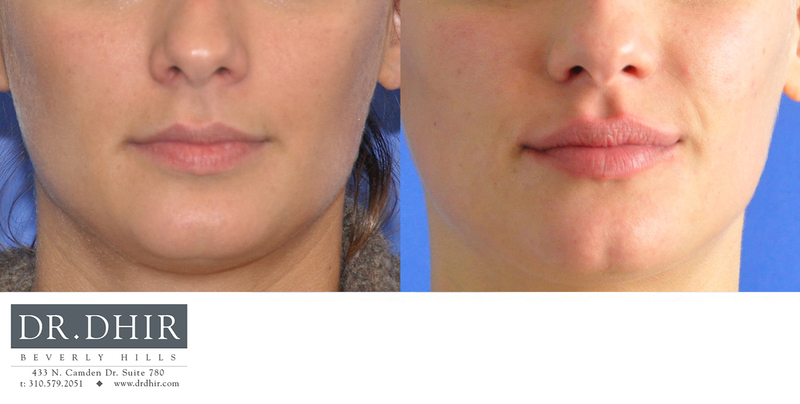 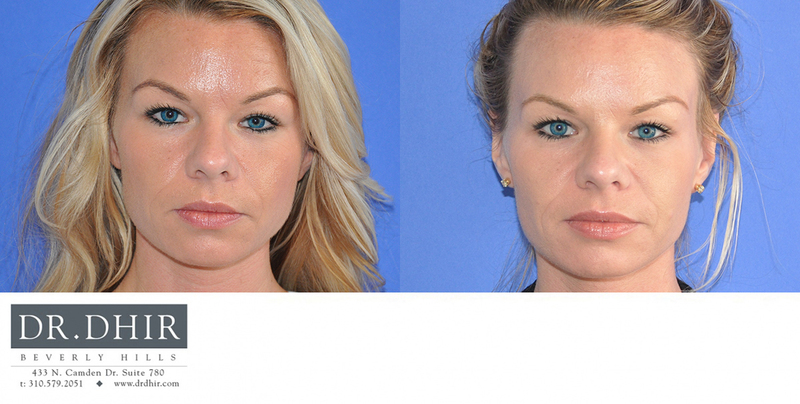 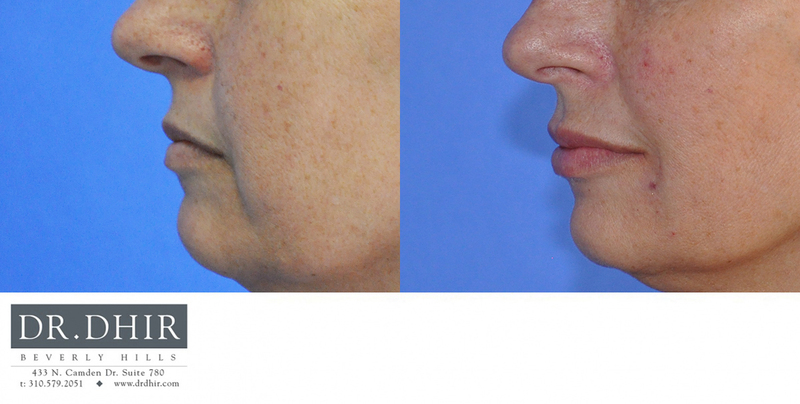 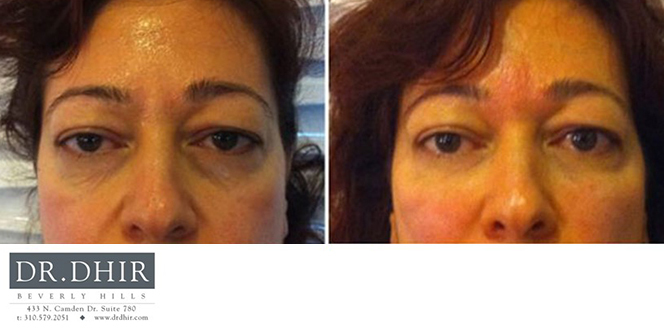 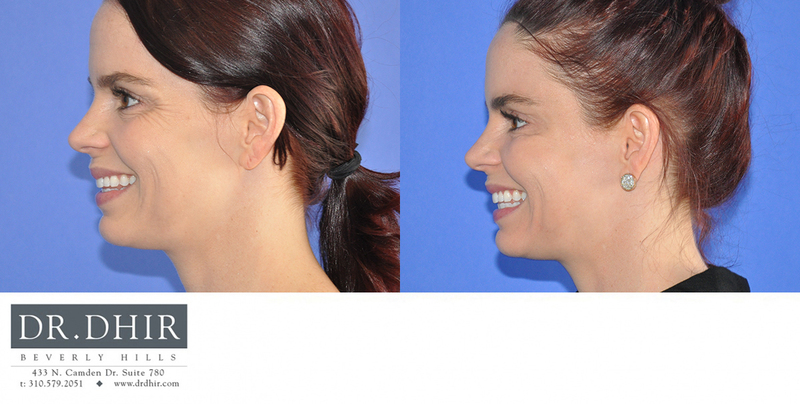 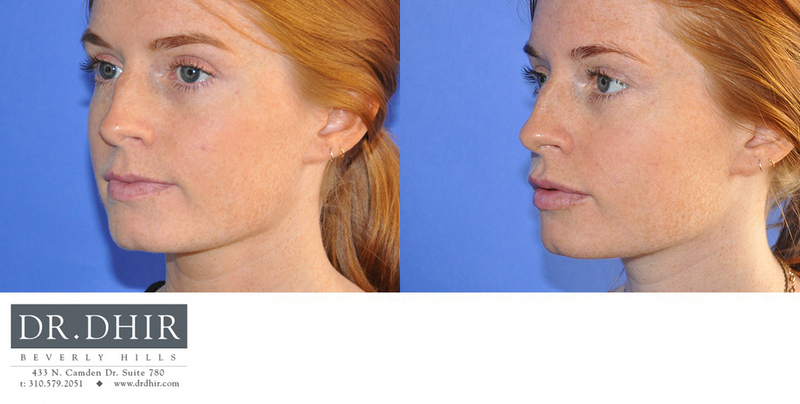 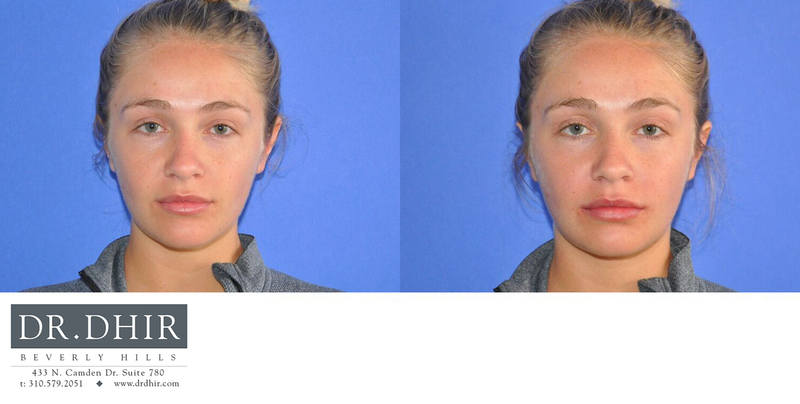 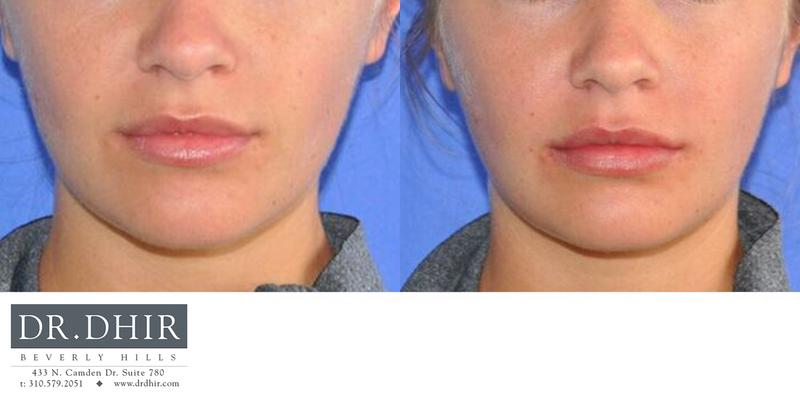 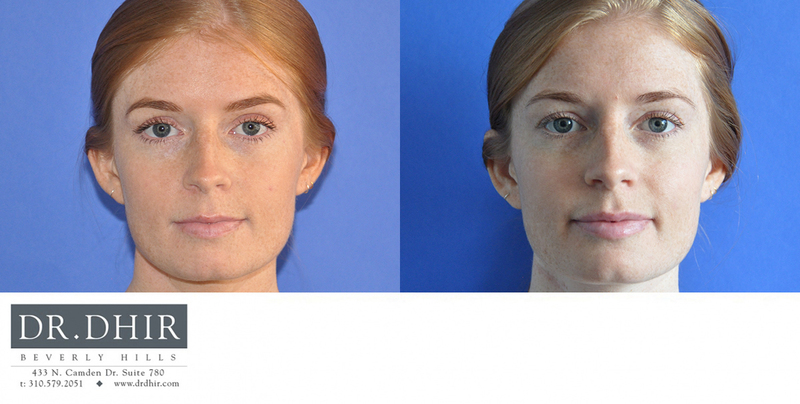 The procedures can restore volume around the eyes, cheek region, smile lines, frown lines, and lips. 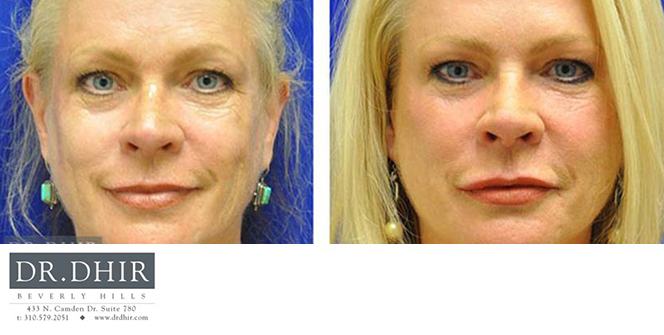 By reestablishing volume, you simultaneously fight gravity and add contour to achieve a youthful appearance. 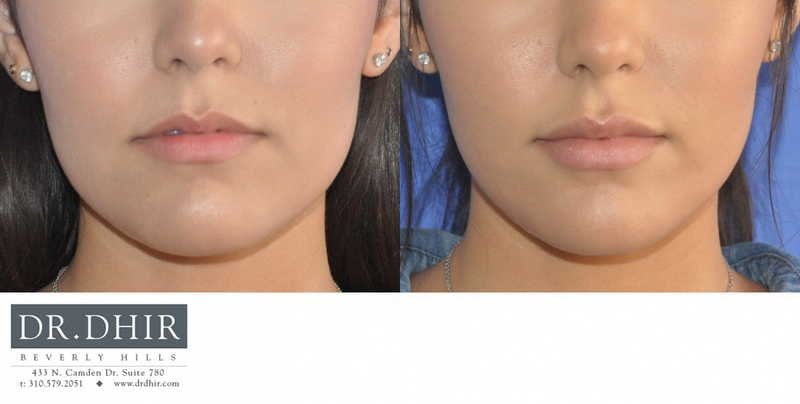 Dr. Dhir’s philosophy is to meticulously place volume in key regions of the face that elevates the facial skin to return proper contouring of the facial structure. 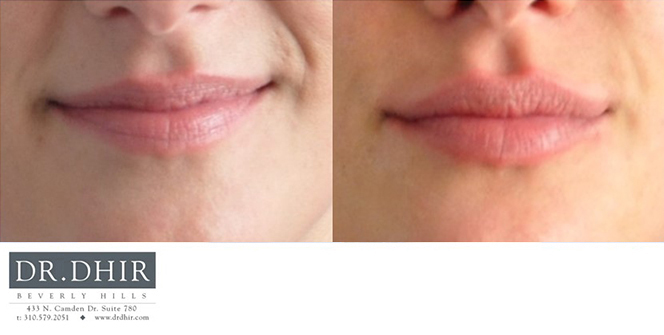 Similarly, lip augmentation can produce a revitalized fullness to the lips. 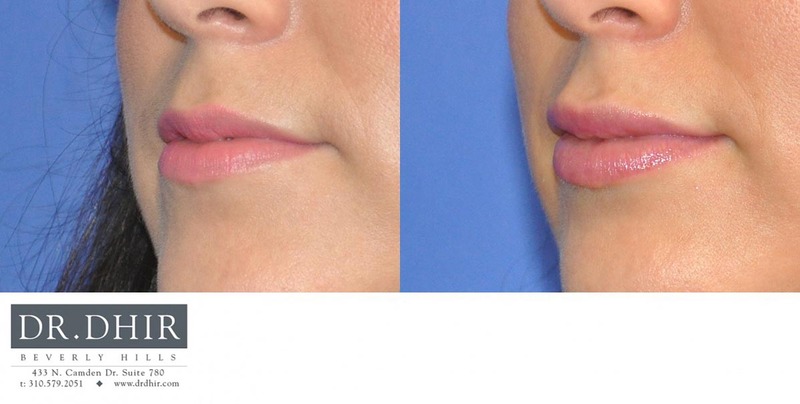 By focusing on lip shaping, we can recreate the “M” and columns between the nose and upper lip for a youthful, attractive appearance. 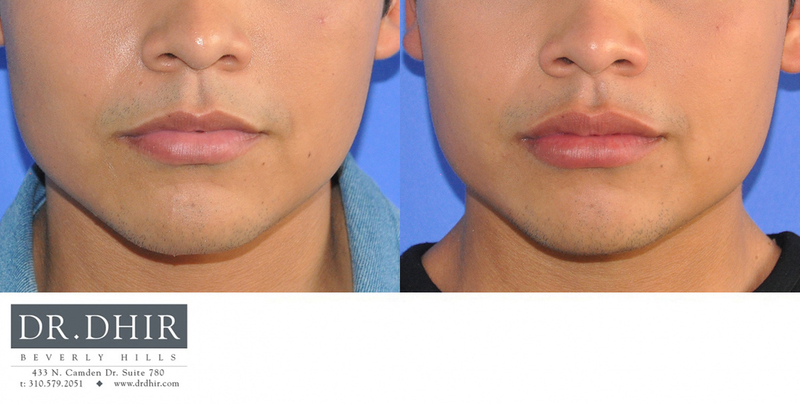 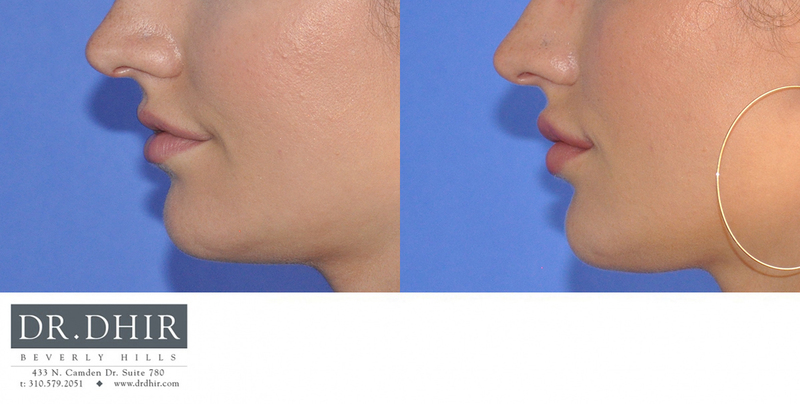 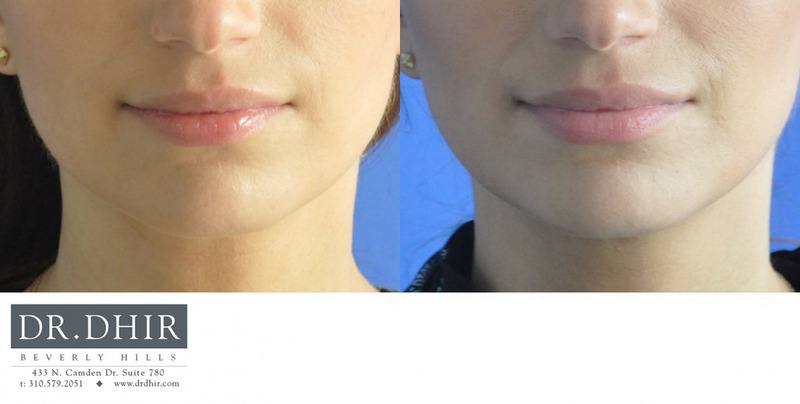 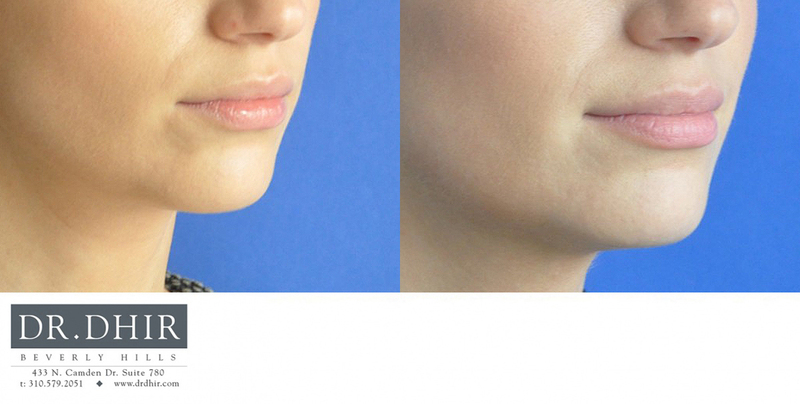 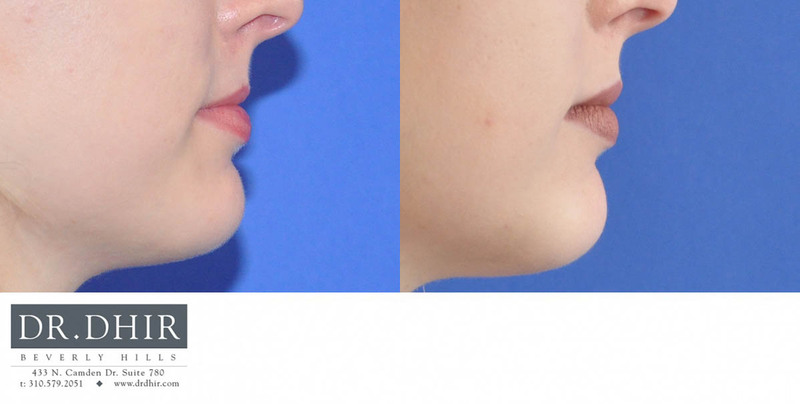 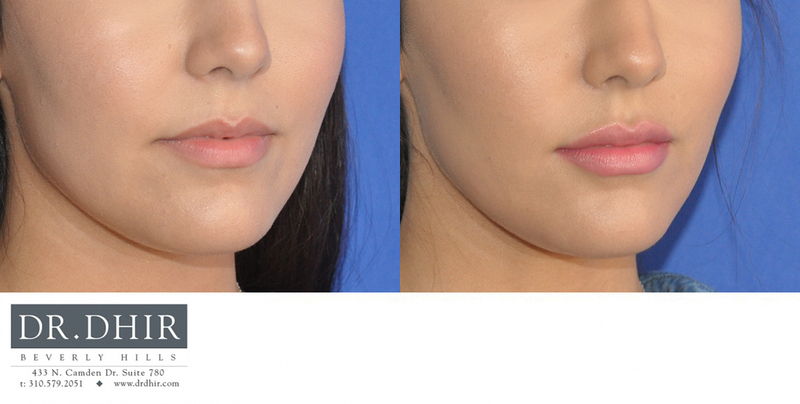 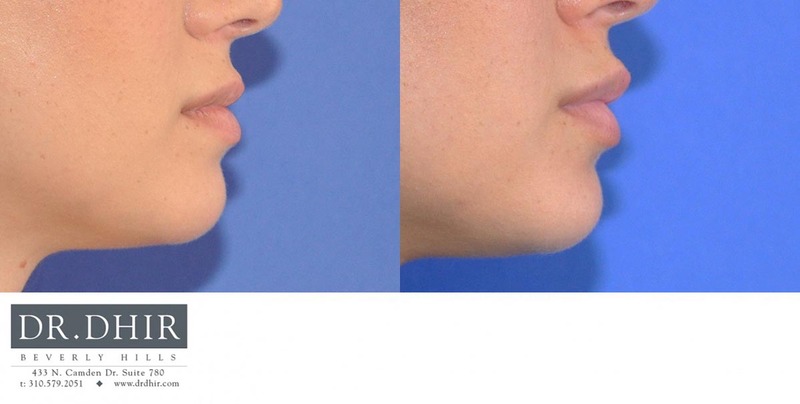 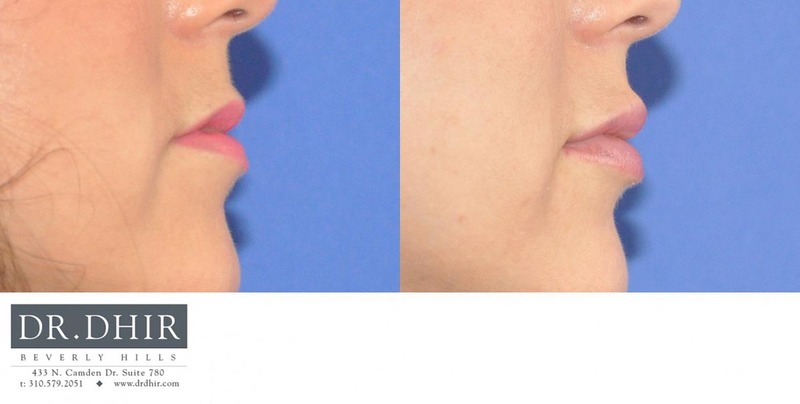 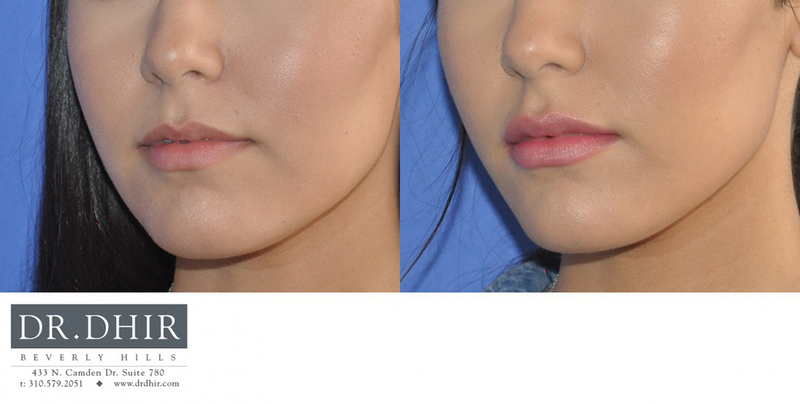 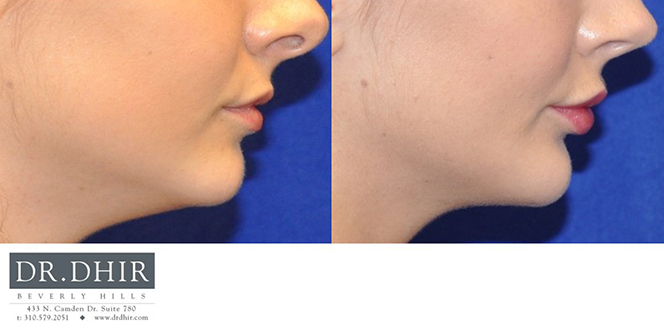 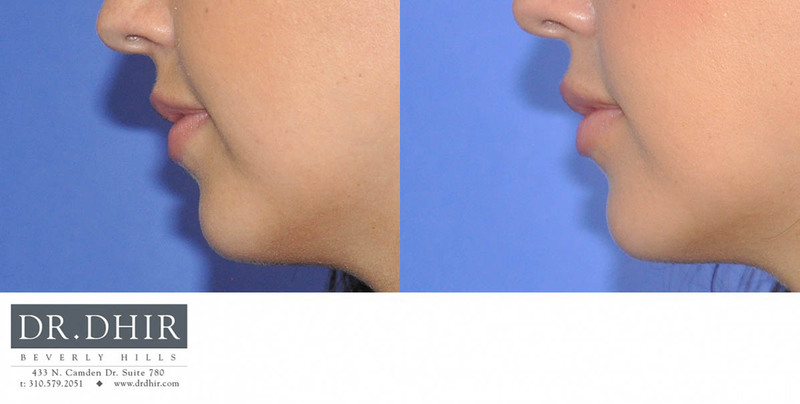 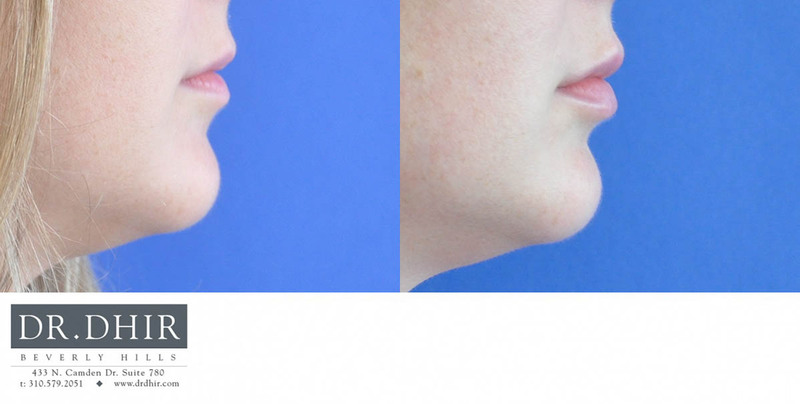 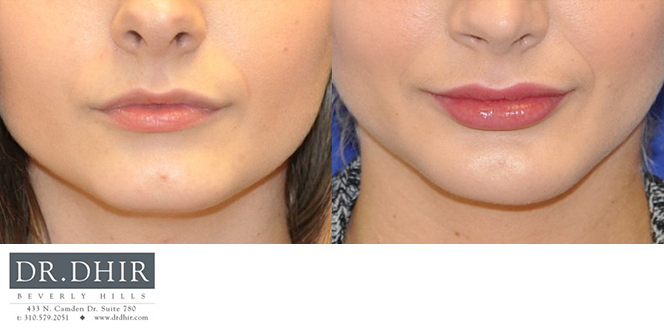 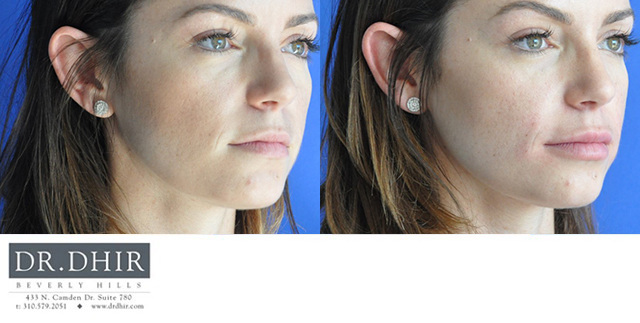 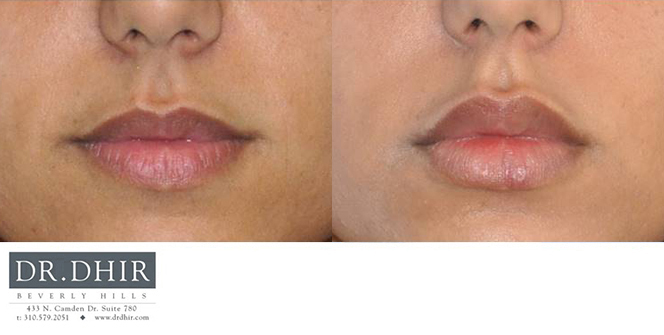 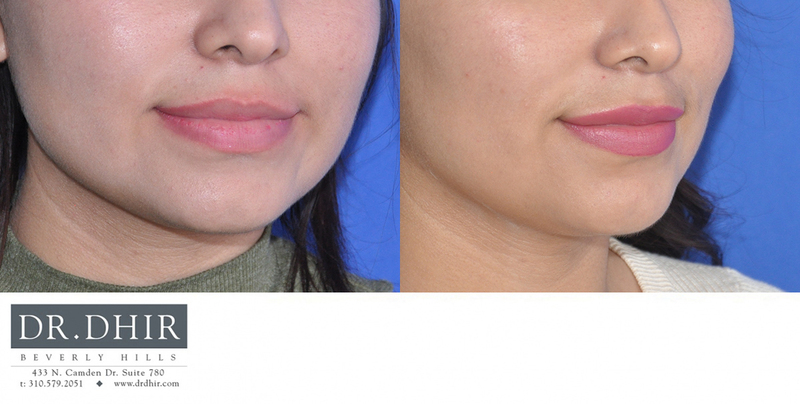 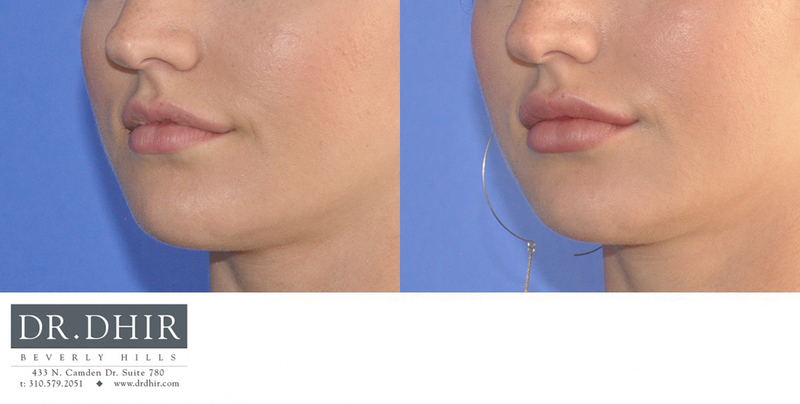 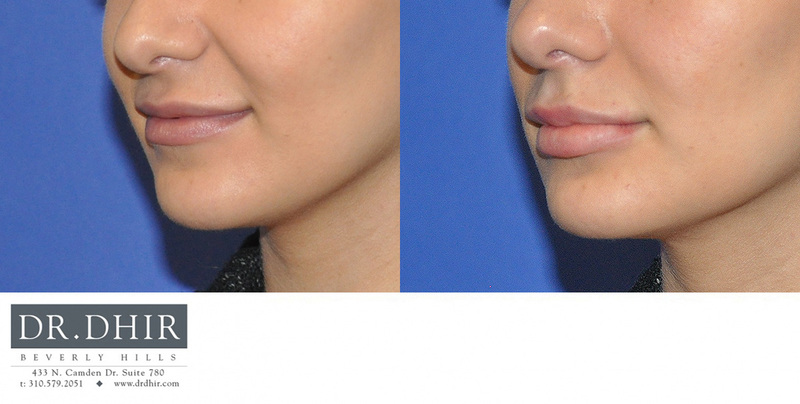 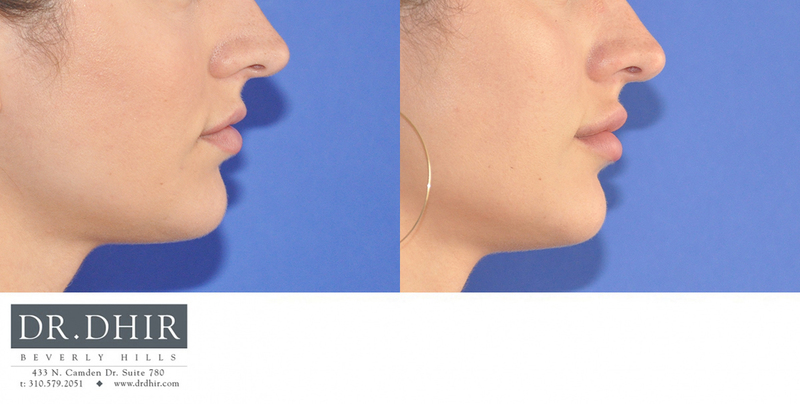 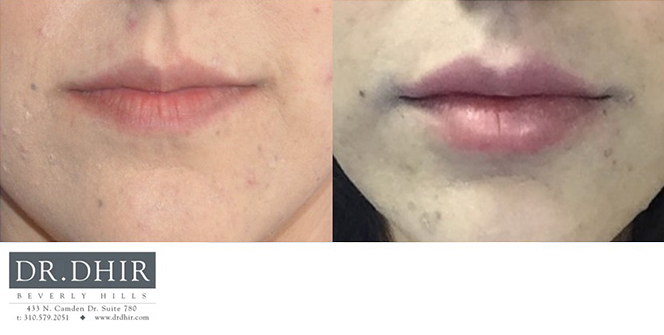 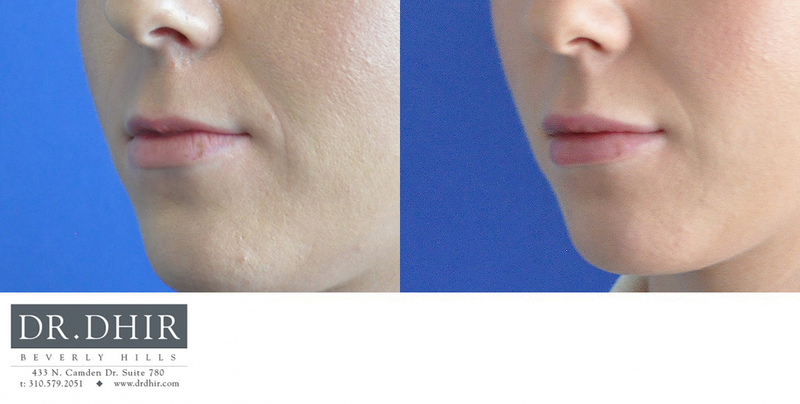 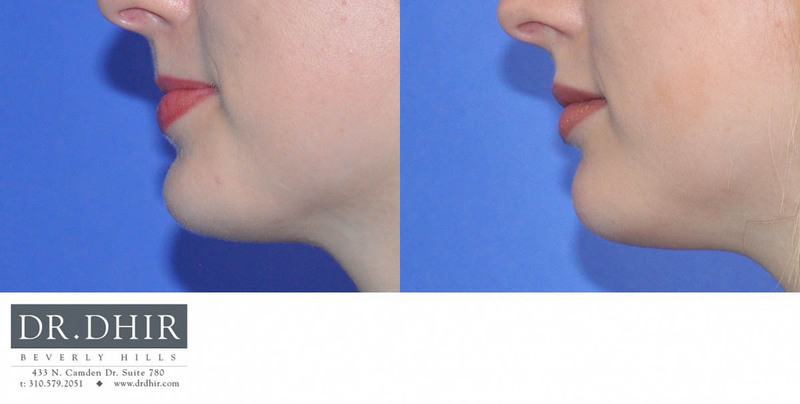 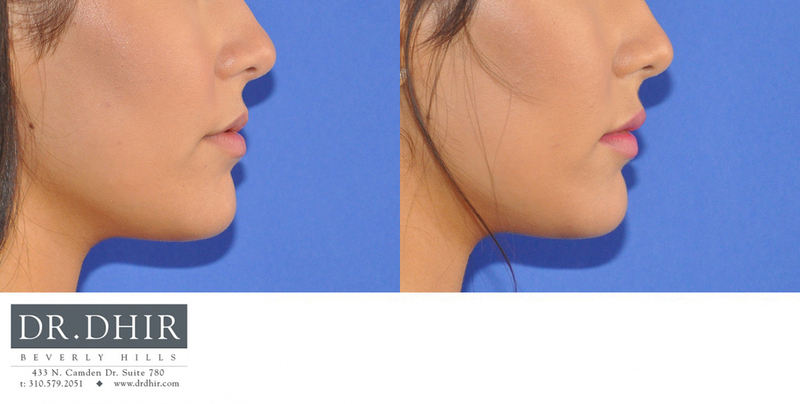 Dr. Dhir’s proprietary “Bow & Arrow” technique provides an attractive lip with proper shape and fullness. 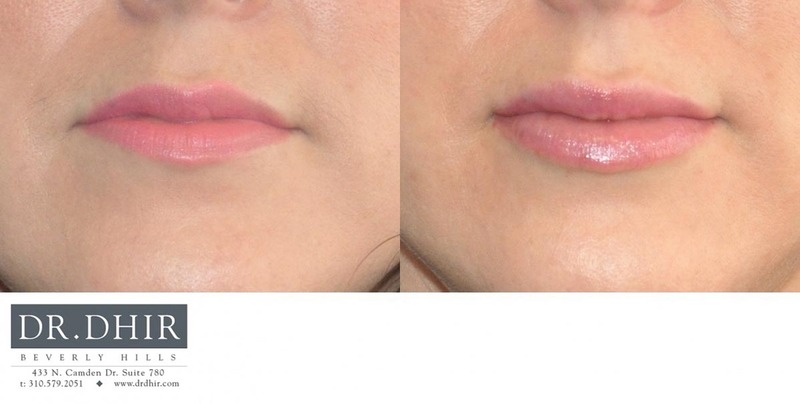 This technique protects from a duck or joker lip appearance. 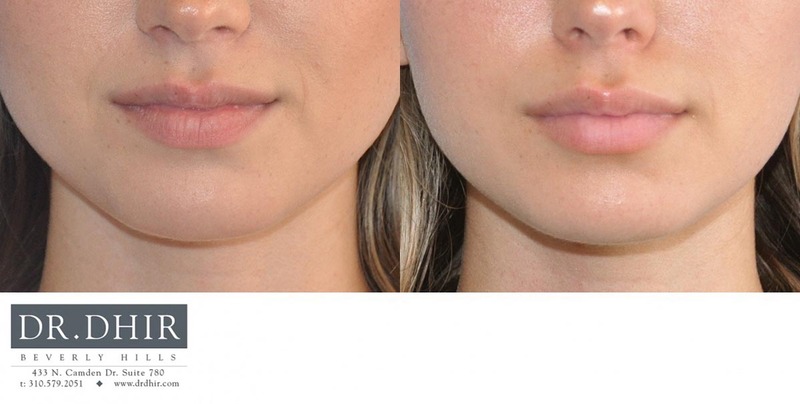 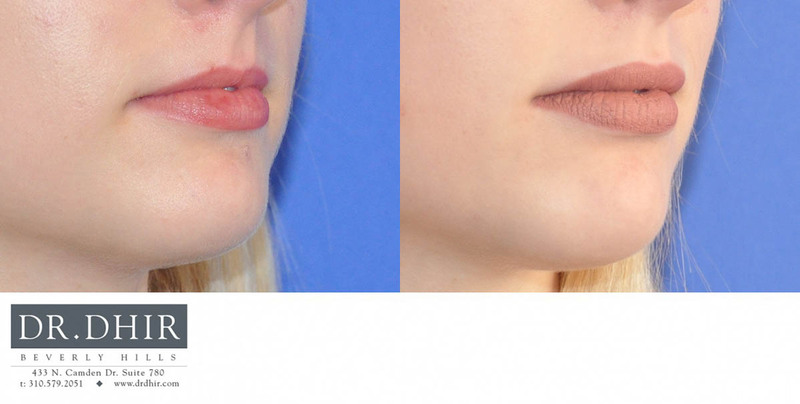 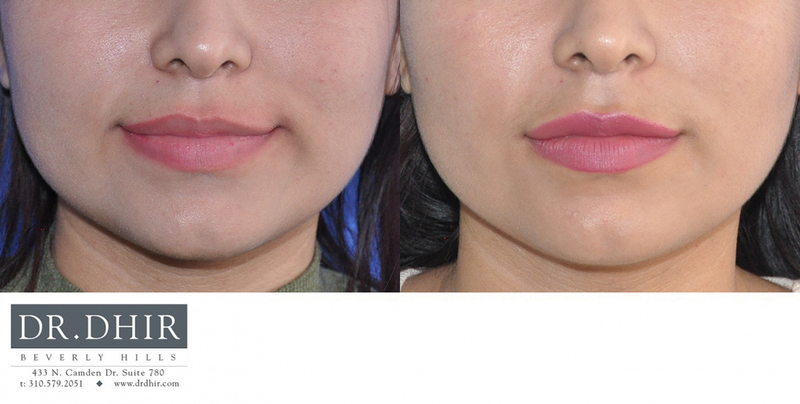 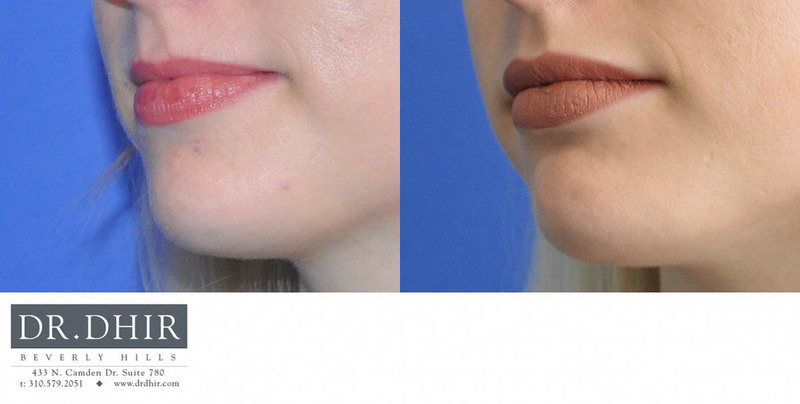 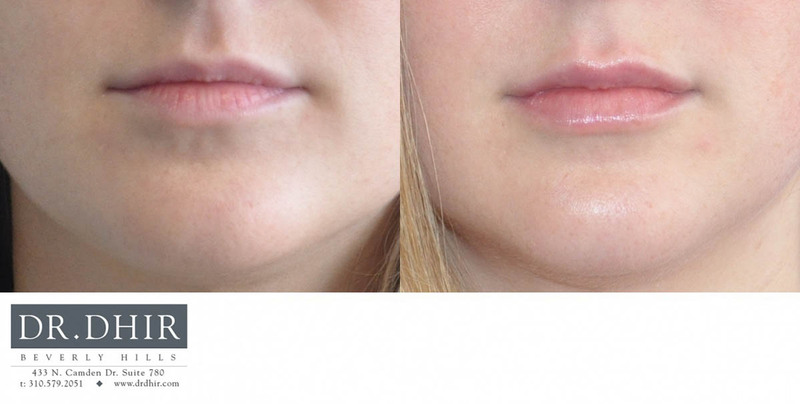 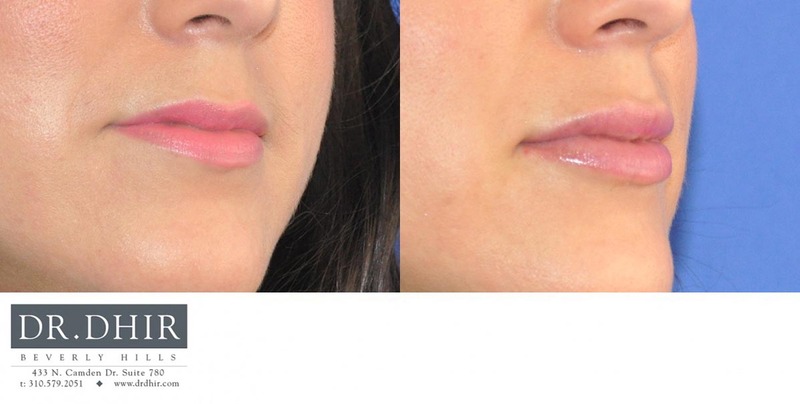 A lip lift also can decrease the distance from the nose and the upper lip as well as allow for more of the upper teeth to be visible when the mouth is slightly open. 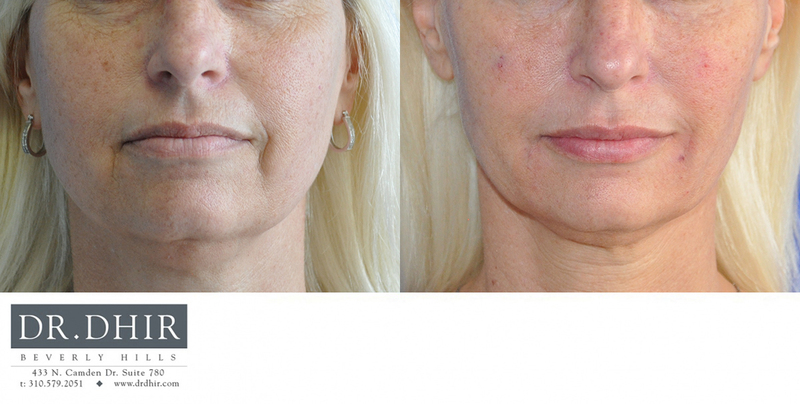 As our skin loses volume and gravity pulls it downwards, the skin weakens and is more susceptible to sun damage, age spots, dryness, and pore size changes. 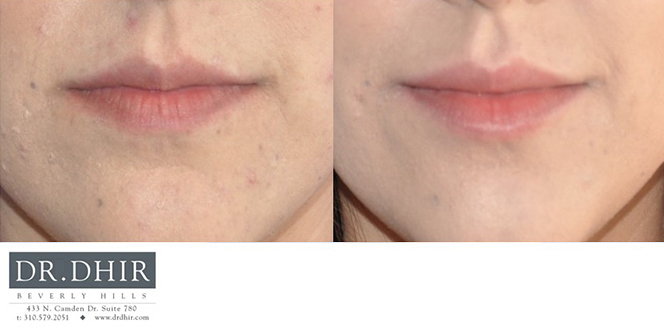 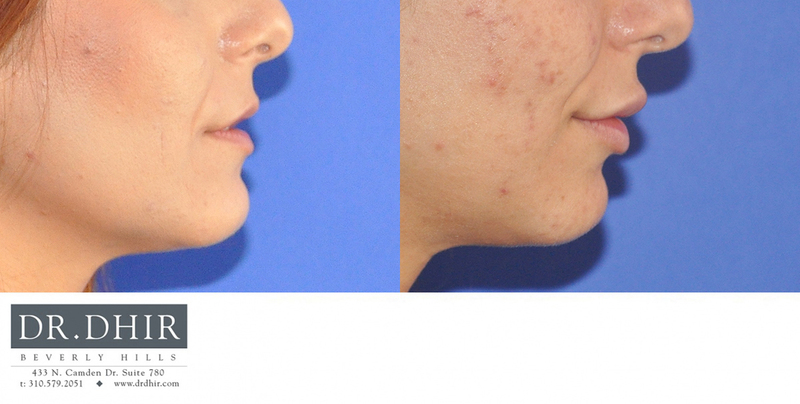 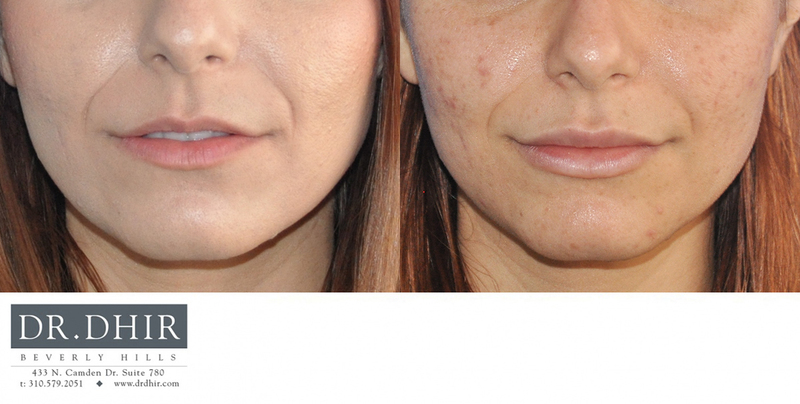 By utilizing your own blood and activating the healing cells (PRP), microneedling is a unique treatment option for improvement of acne scars, surgical scars, stretch marks, wrinkles, fine lines, hyperpigmentation, lax skin, sun damaged, large pores, and uneven skin texture. 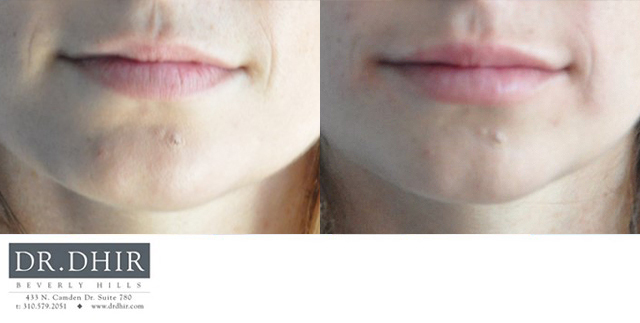 The process involves micro needles that cause pinpoint trauma to the skin. 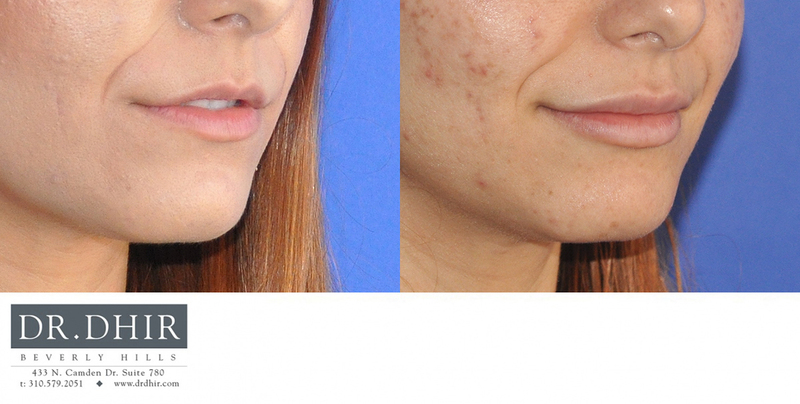 The Platelet Rich Plasma (PRP) is topically placed on the skin for absorption leading to improved skin color, texture and tone. 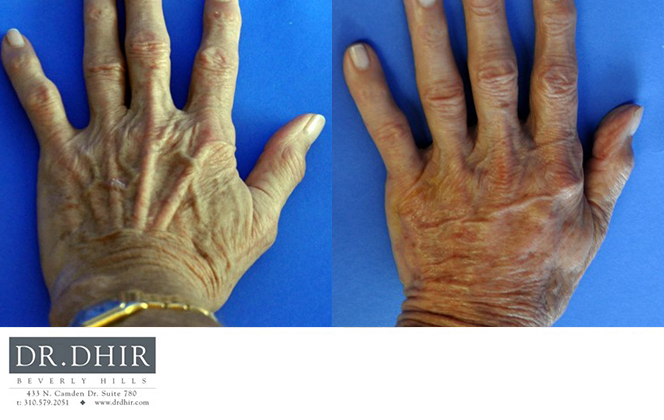 Aging affects us all in the way we act and the way we feel about ourselves. 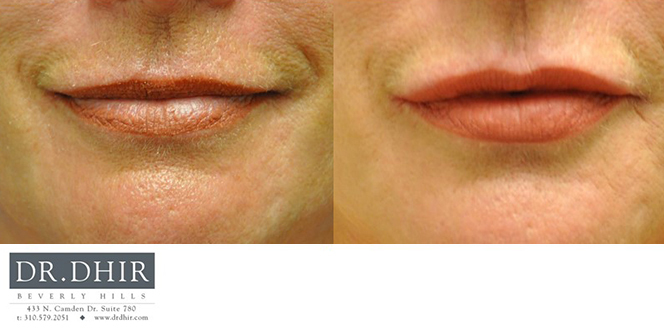 But with technologic advancements in skin care, we may now reverse signs of aging by improving skin tone and volume. 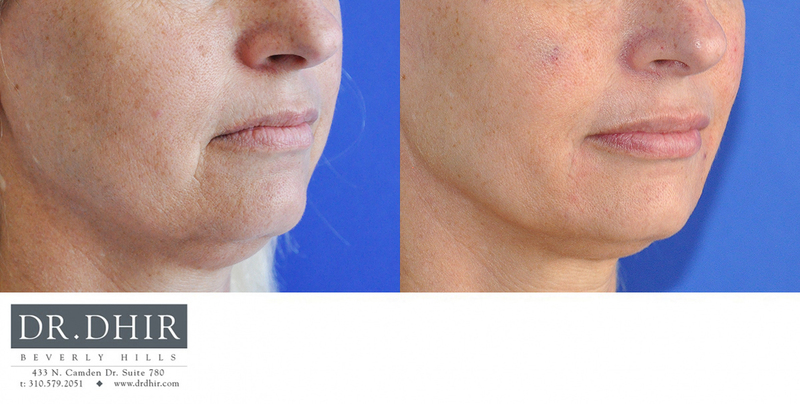 Thermage is a proven, unique radiofrequency treatment that can help improve the appearance of sagging or loose skin, giving you a smoother, sleeker and younger look and feel. 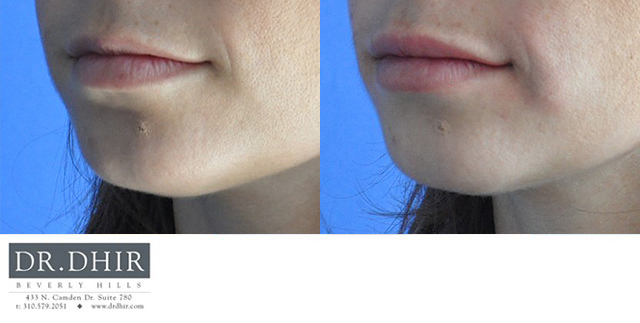 Thermage works with little down time and delivers a natural looking result. 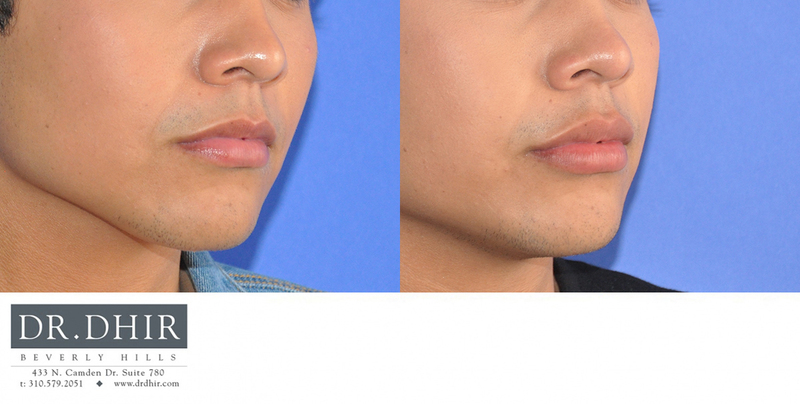 It’s you, just younger looking and more confident. 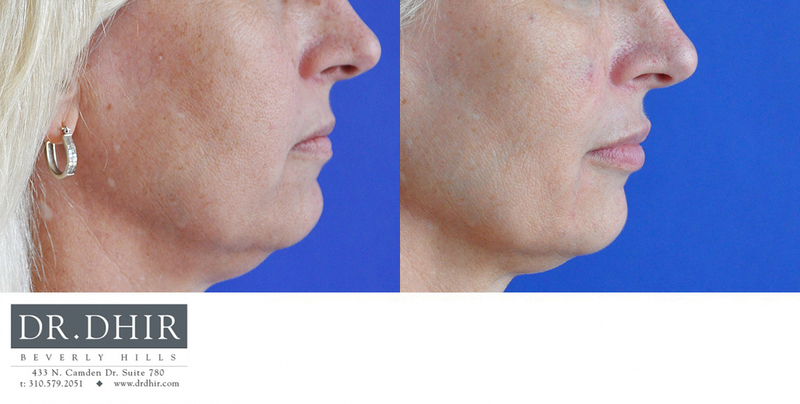 • The Body – aging doesn’t just affect the skin on our faces, our bodies see the effects too, with crepey, sagging skin and unwanted bulges and dimples. 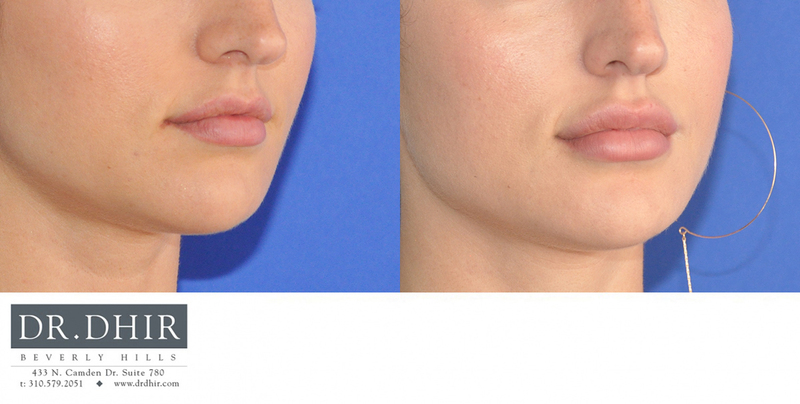 Thermage is a non-invasive way to smooth the skin on our bodies and even temporarily improve the appearance of cellulite. 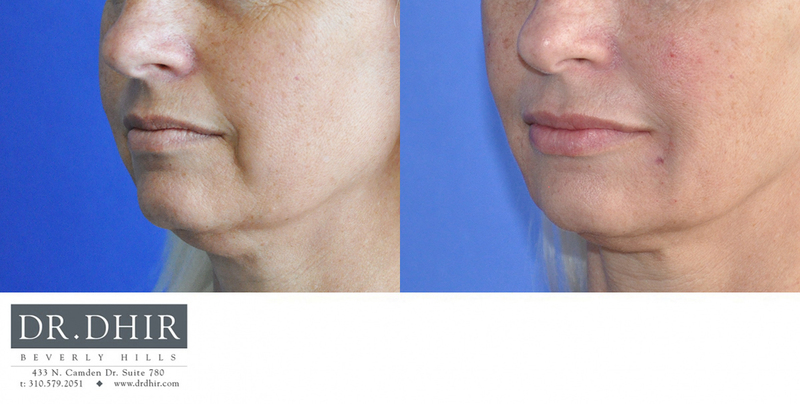 Ultherapy harnesses the power of ultrasound to transform, tighten and non-surgically lift the brow, chin, neck and chest. 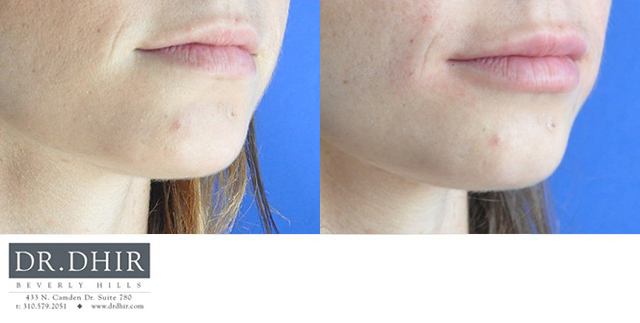 Ultrasound has been used throughout the medical field for more than 50 years—and Ultherapy has been established as effective in clinical studies* and in over a million treatments worldwide. 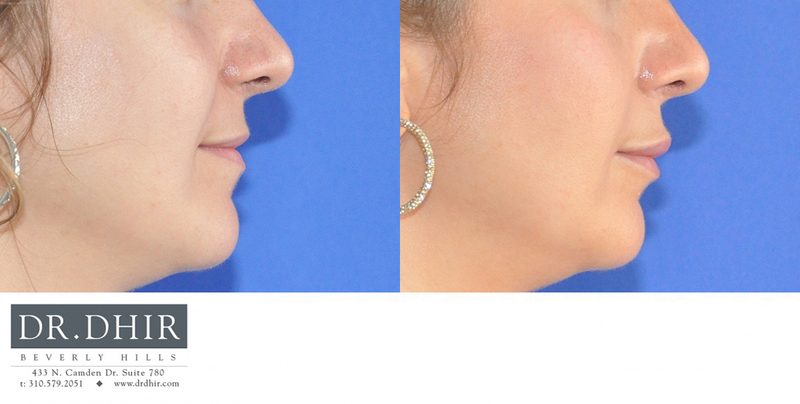 Whereas liposuction remains the gold standard for fat removal of the body and neck, patients often desire non-surgical options for fat removal. 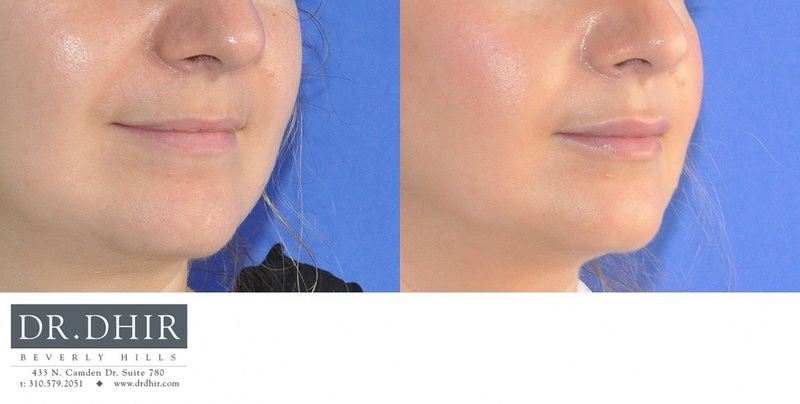 The CoolSculpting fat-freezing procedure is the only FDA-cleared, non-surgical fat-reduction treatment that uses controlled cooling to eliminate stubborn fat that resists all efforts through diet and exercise. 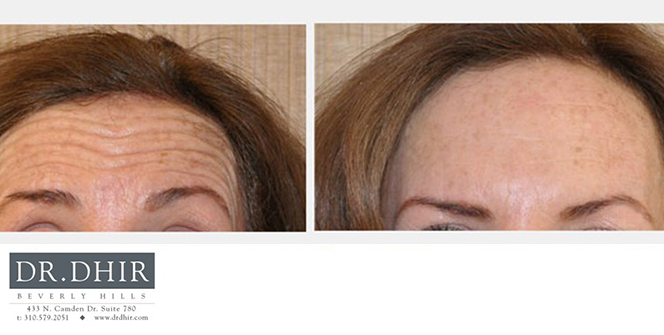 The results are proven, noticeable, and lasting. 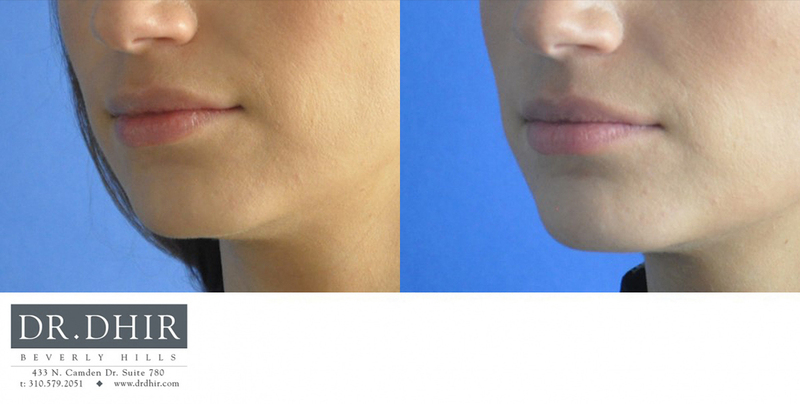 Treatment areas include the chin, neck, arms, love handles, abdomen, bra line and inner thighs. 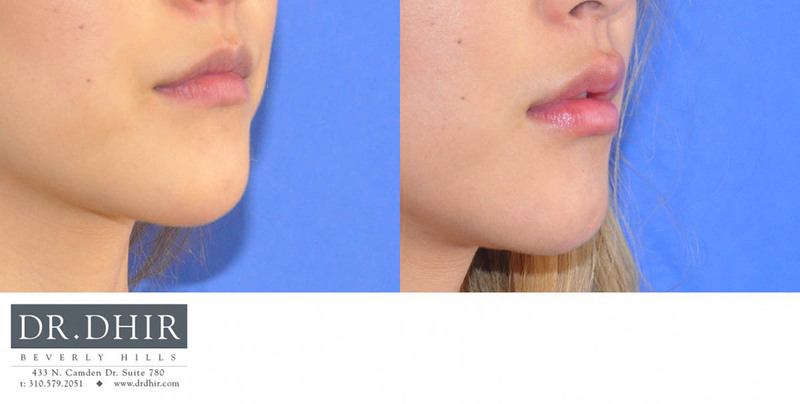 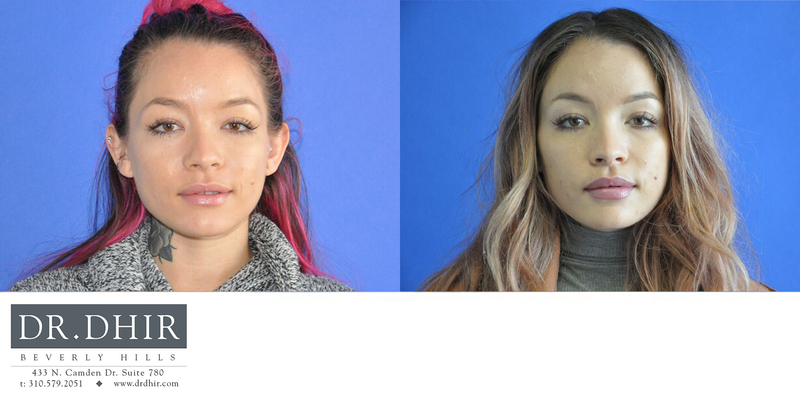 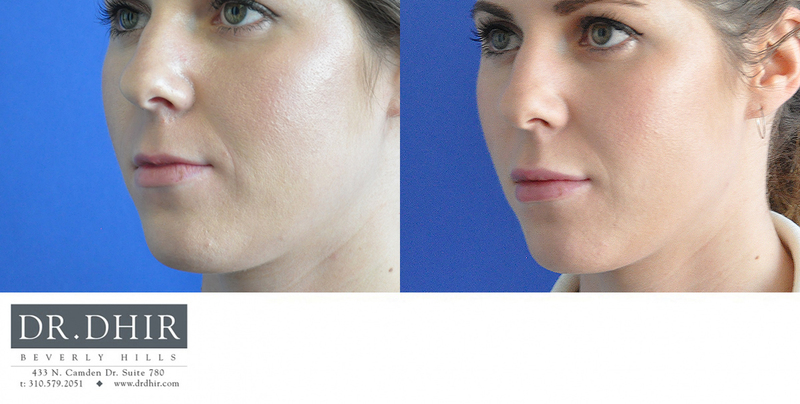 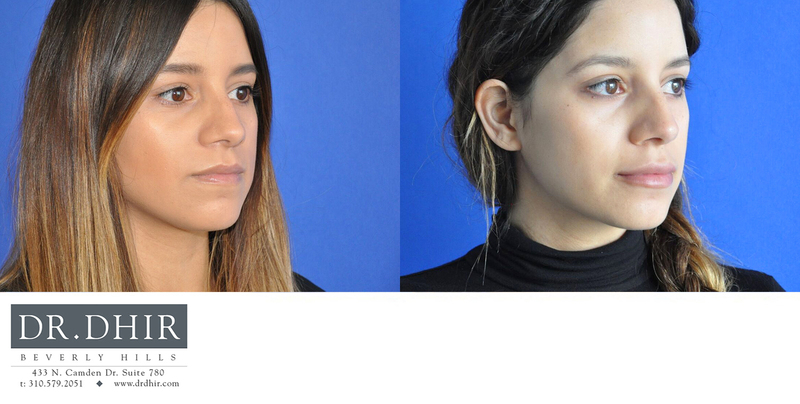 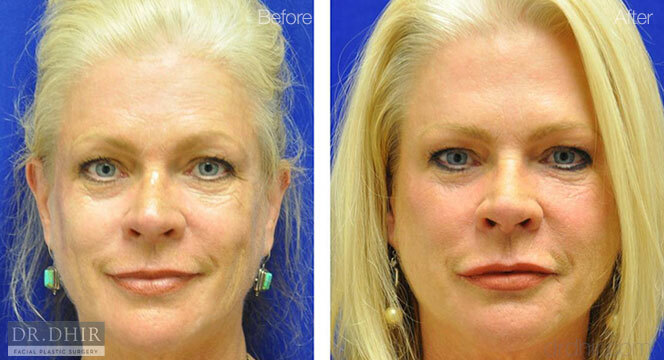 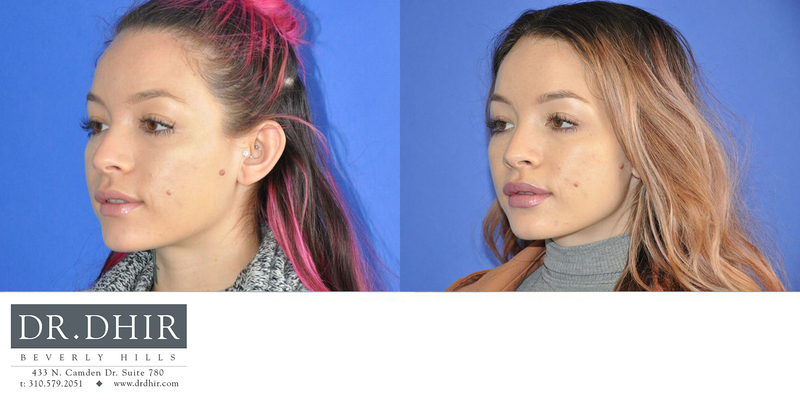 Successful filler augmentation procedures will avoid the following undesired outcomes.